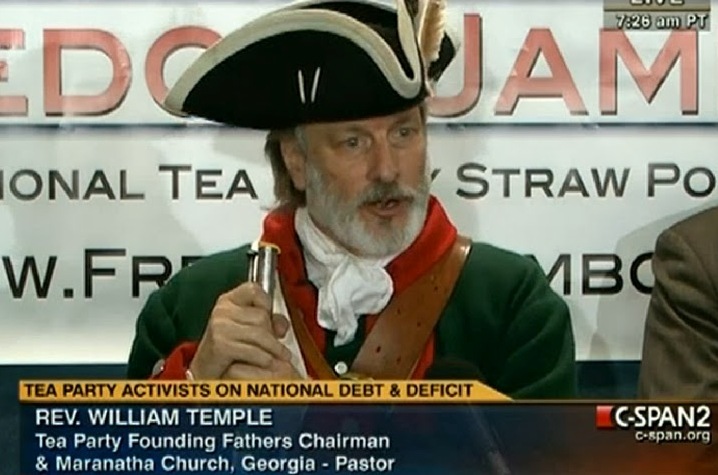 Tea Party activist. Photo: Alternet.org. They’re at it again — Let’s Go Austin, the heavily funded elite outfit established to campaign for the official Highland-Riverside urban rail plan and $600 million in City bonds to fund it, are continuing their preferred tactic of trying to smear tar over their opposition to make them seem like something they aren’t. And in this case, the tar is made from Tea. Project Connect leaders and the Let’s Go Austin campaign know very well that this is not only a fraud, it’s an absurd fraud. Ironically, what’s made this light rail ballot battle especially newsworthy — even on a national scale — is that rail supporters and “progressive” community leaders and neighborhoods have been in the forefront of criticizing and opposing the official planning process and its ultimately selected route plan since the beginning. Obviously driving this “fear & smear” propaganda is the need to obfuscate the inconvenient truth that Austin’s strongest rail supporters have spearheaded the opposition to this corrupt, misguided rail proposal from the get-go. These have included eminently pro-transit groups like the Light Rail Now Project, AURA (Austinites for Urban Rail Action), the nonprofit Central Austin Community Development Corporation (CACDC), Our Rail, and important core-city neighborhood groups that have a firmly established record of supporting urban rail, and yet have also been at the forefront of the criticism of, and eventual opposition to, the whole thrust of Austin’s urban rail planning since its inception the mid-2000s. 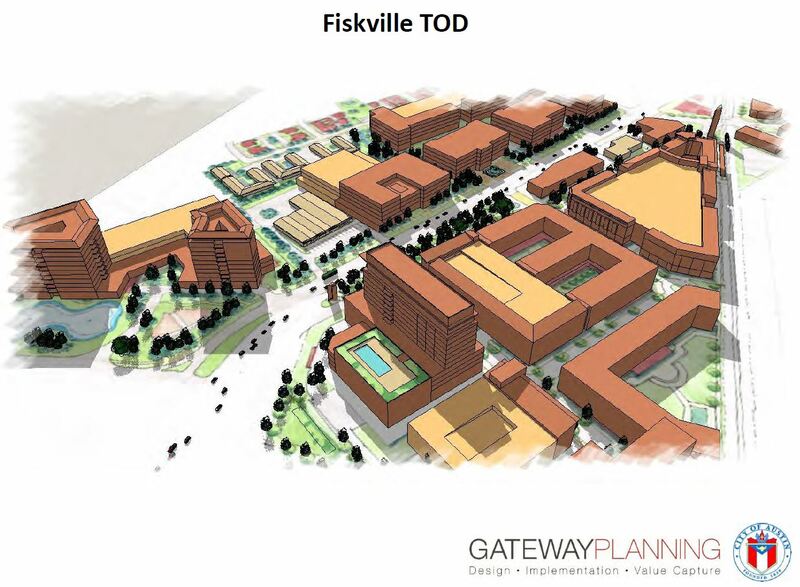 And it’s been these groups in particular that have continued to spearhead opposition ever since the Highland-Riverside proposal was solidified late last year. 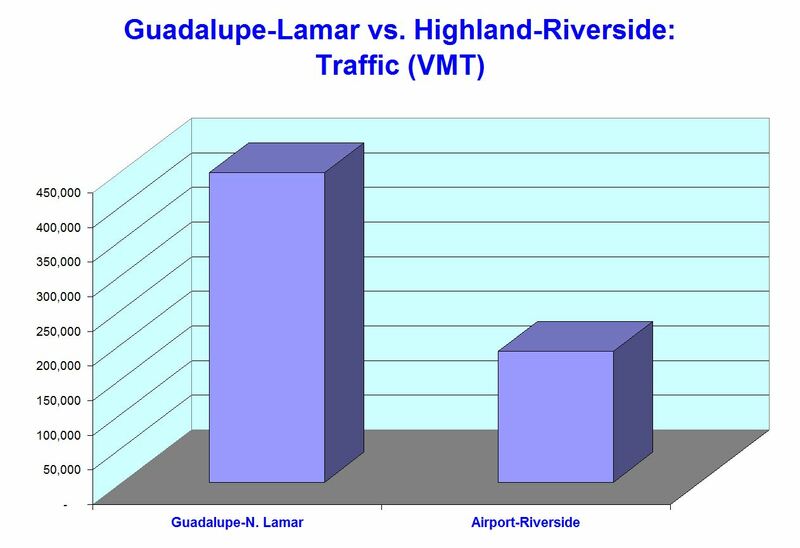 Light Rail Now, CACDC, Our Rail PAC, and other groups strongly support urban rail in the Guadalupe-Lamar corridor. And the anti-rail opposition? Of course, highway proponents, anti-taxation activists, and, yes, some Tea Party sympathizers have emerged to oppose this rail bonds proposition — but wouldn’t they do so in any case? What’s surely revved them up, and encouraged them to pour exceptionally heavy resources into this fracas, is undoubtedly the leading role of rail supporters disgusted and outraged at the corruption and distortion of the rail transit planning process and de facto disenfranchisement of the wider community from involvement. But, in a Democratic Party-leaning city with a substantial base of “progressive” voters, Let’s Go Austin clearly deems it useful to try to paint the opposition as a monolithic Tea Party chimera. And, by strong-arming a preponderant chunk of the local business community, the local civic leadership have managed to lead much of the major local media to buy into this contrived portrayal of the urban rail controversy and the bonds debate as merely a faceoff between conservative roads and anti-tax partisans, hostile to rail transit, versus future-looking, rational “progressives” favoring the official urban rail proposition. This deception is pretty brazen. But it gets worse — how about some real chutzpah? Citing LGA’s campaign funding of nearly half a million dollars, with an average donation of over $6,000 (“A grassroots campaign this is not”), AURA’s study found that some of LGA’s largest donors were also major donors to the Texas Republican Party. You know, the one controlled for much of the past decade by the … Tea Party? which contributed $25,000. RECA also has a long history of contributing to Republicans, including $50,000 to Rick Perry and more than $63,000 to David Dewhurst. A quick search of RECA’s history in the Texas Tribune’s campaign finance database finds at least $180,000 in contributions to major Republicans. The Republican donor trend continues with individuals, corporations, and PACs that donated to the LGA PAC in the $1,000–$5,000 range. A set of eight donors who gave $36,500 to the LGA PAC (almost 30% of the funds we have not yet detailed here) also contributed more than $700,000 to a veritable Who’s Who of the Texas Republican Party. All told, the LGA PAC’s donors and DAA board members have contributed more than a million dollars to Republican campaigns. If you were to apply the Let’s Go Austin PAC’s preferred campaign strategy, you’d say that a vote for Prop 1 is a vote for Dan Patrick! 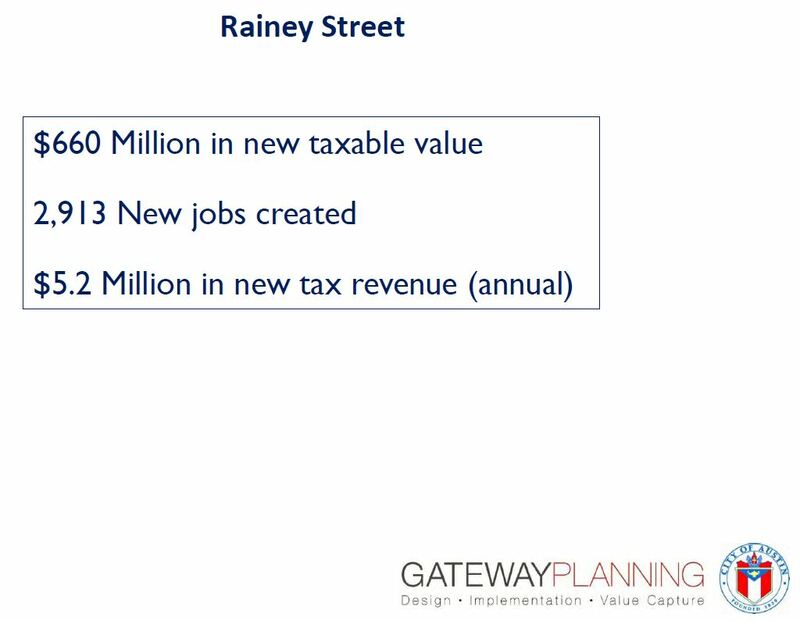 Given this funding base, perhaps it’s no wonder Prop 1 sacrifices the rest of Austin’s transit system to benefit a handful of private business owners and real estate developers. Funneling taxpayer money into private hands is the very essence of the Texas Republican Party’s ‘business friendly’ agenda, and a similar agenda is at the center of the Let’s Go Austin PAC’s campaign. Just follow the money. There’s nothing particularly reprehensible in major donors to a rail transit campaign also having contributed to the Republican Party. But in this case, some of Let’s Go Austin’s most generous funders have been pumping huge amounts of money to a Texas GOP that not only has staunchly resisted state funding for mass transit and instead favored highway expansion, but is dominated by the Tea Party. 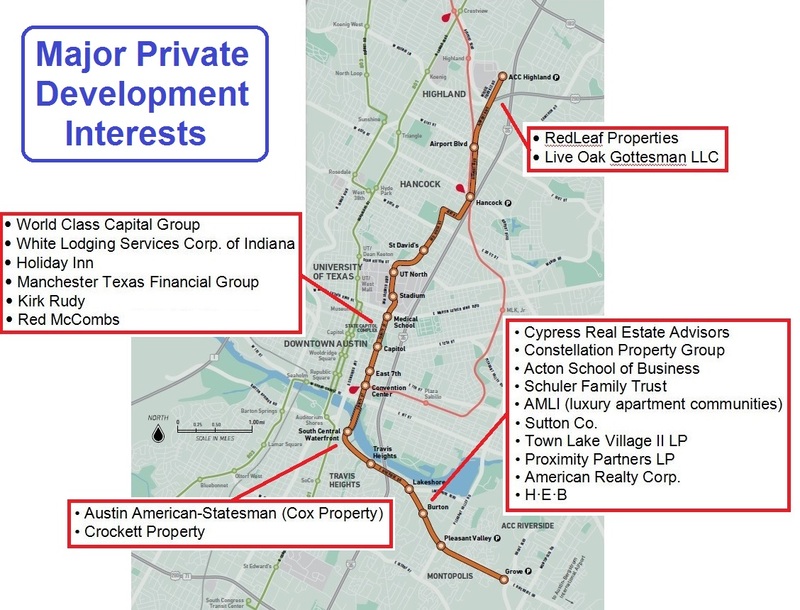 You know — the same Tea Party that LGA is using as a bogeyman to frighten Austin voters against listening to the “progressives”, liberals, leftists, and transit advocates telling them to oppose this urban rail bonds proposition. Now, that’s chutzpah. On steroids. 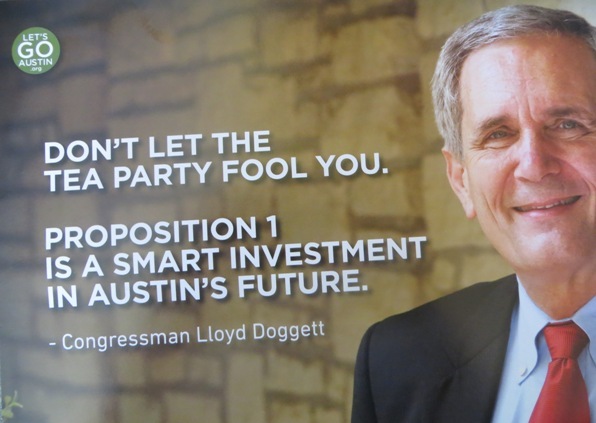 Lloyd Doggett — Dupe, or accomplice in rail bonds campaign’s “Tea-baiting”? Campaign mailer from Let’s Go Austin publicizes Rep. Lloyd Doggett’s backing of urban rail bonds proposition in Nov. 4th election. Was Rep. Doggett duped or “strong-armed” into supporting this seriously flawed proposition? It’s become clear that a prominent, desperate tactic of the “Let’s Go Austin” campaign to promote the urban rail bonds ballot measure is to “Tea-bait” the opposition — to try to smear all of us, “progressives”, liberals, leftists, rail transit advocates, transit critics, moderates, conservatives, neighborhood associations, and other opponents of this misguided proposal — as homogeneous minions of the rightwing Tea Party. Most recently, apparently in an effort to drop a late-campaign “bombshell”, they’ve managed to enlist liberal Democratic U.S. Representative Lloyd Doggett in this smear campaign. Whether Rep. Doggett was aware of any of this is dubious. In any case, it’s apparent that, to corral both political and business support into (at least nominally) backing their lemon of an urban rail plan, supporters of the urban rail plan and ballot proposition have been engaging in a whole lot of strong-arming. Businesses, for example, are vulnerable to this because they need City of Austin permits for expansion or other commercial needs, or perhaps they’re angling for a public contract. Not only has there been a kind of “bandwagon” effect, but top officials and civic leaders have seemed to require allegiance to the Highland-Riverside rail plan as virtually an article of faith, akin to “kissing the royal ring”. Similarly intense has been the political pressure from the local Democratic Party elite to extract lockstep fealty to the urban rail bonds proposition from the Democratic fold — both elected officials as well as wanna-bes. This now has apparently included the “bombshell” of Lloyd Doggett’s endorsement — first with his participation in a Let’s Go Austin rally on Oct. 19th (the day before the start of early voting), and now by being featured in a Let’s Go Austin campaign mailer (see graphic at top of this post). Is a Congressional representative really vulnerable to being “strong-armed” by mere local and state-level party officials? It’s certainly plausible, since U.S. elected representatives depend on strong local party support in their home districts to help them at re-election time. And with Texas state GOP gerrymandering that has been moving the boundaries of his district, Rep. Doggett probably feels especially vulnerable. Keeping good relations with the local elite is a must. In any event, whether this is a case of being duped or being a willing accomplice, for Rep. Doggett — and a large segment of his “progressive-liberal” supporters who are dismayed by his alliance with the Let’s Go Austin forces — his emergence into public support of this widely unpopular ballot proposition is very unfortunate. And eroding a major segment of voter support is surely not helpful to Rep. Doggett’s political security. Excerpt from Travis County’s sample ballot for Nov. 4th shows that the urban rail bonds measure will be titled just “Proposition, City of Austin”. Screenshot by L. Henry. 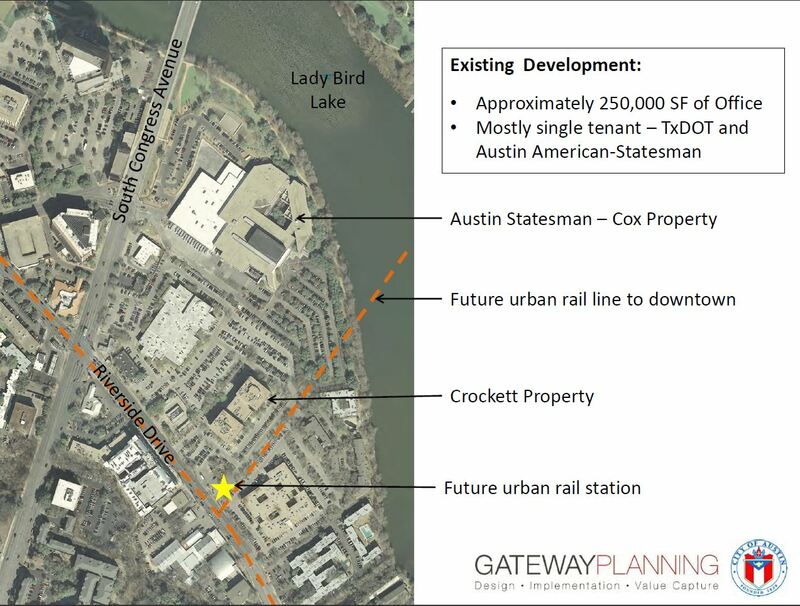 For months, the City of Austin’s urban rail bonds proposal has been designated “Proposition 1”, and that’s how it’s been referred to by all sides in this dispute. Apparently on the basis of information from city representatives, media reporters have been referring to it that way since about the first week of August. As this sample shows, on the ballot the urban rail bonds proposition is presented after all the choices for mayor and council. It’s important that this new designation, and the position of the “Proposition, City of Austin” measure, is made clear to voters. Anecdotal evidence suggests that anti-rail bonds voters are more motivated in this election, so confusion works to the benefit of the Let’s Go Austin campaign to support the urban rail bonds and the seriously flawed Highland-Riverside line they’re intended to finance. 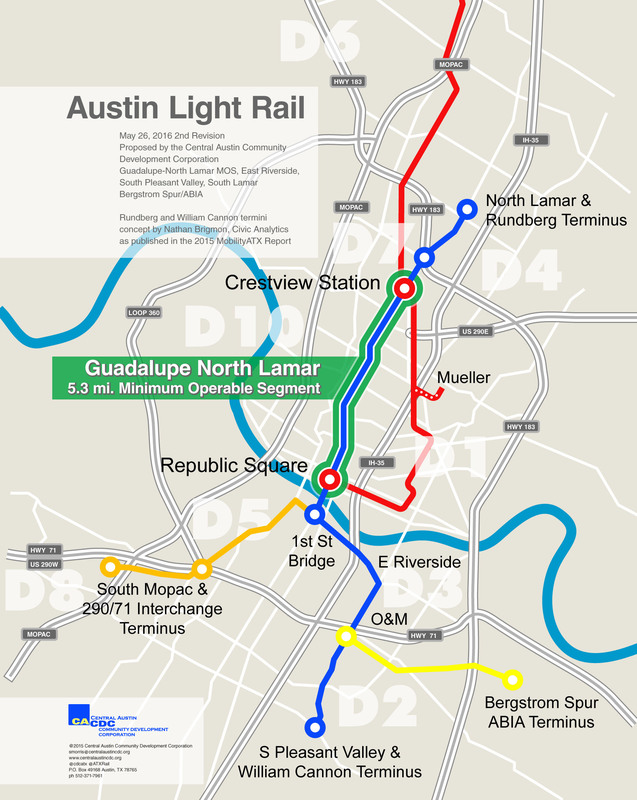 How soon to get Austin’s urban rail on track after Nov. 4th? How quickly can Austin get another rail proposal on the ballot if Proposition One fails on Nov. 4th? Pass or fail, I think any rail proposition that would be ready for federal funding is at least three years out — i.e., 2018, considering that the new 10-1 council gets up and running early in 2015. If Proposition One passes, the new council would have to deal with the political mandate of $400 million of road funding — most likely, in Certificates of Obligation (COs). And given the nature of COs, meant for emergencies, not for general obligation (GO) situations, the oxygen in council chambers is going to be consumed as new council members (a) hear from the public pro and con and (b) recognize that large city indebtedness limits their ability to expend funds for many other needed things (particularly their own priorities and campaign promises), while at the same time setting the stage for even more debt for a controversial rail project that will surely necessitate giving up a quarter cent of Capital Metro’s sales tax they now collect. Assuming that the issue of COs could be settled in a year’s time and the city could begin selling bonds to fund the detailed planning necessary to qualify for federal funding, it will still take two to three years for the federally mandated steps necessary to get back into line for federal funding. Remember, when Project Connect switched the destination from Mueller to Highland, the current project on the ballot lost its place in line. (Council members knew this when they placed Proposition One on the ballot.) 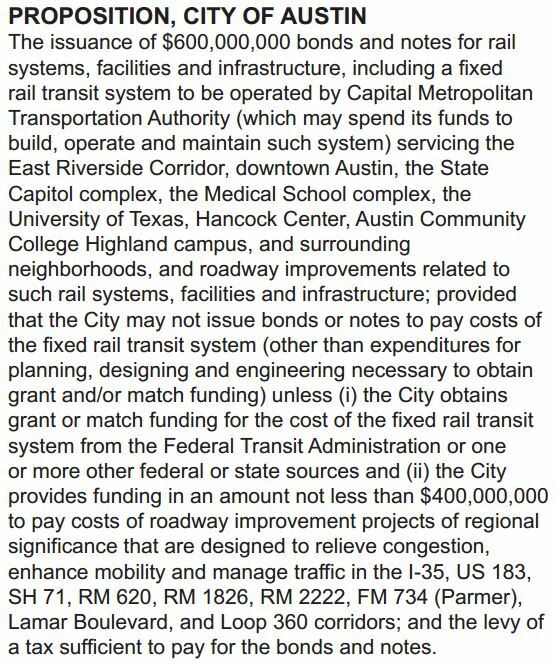 Considering that federal funding is highly competitive, with something like 50 U.S. cities doing some kind of urban rail planning in pursuit of federal dollars, Austin’s current project (supposedly with 18,000 daily riders) for $1.4 billion is simply not cost-effective or cost-competitive. Now if Project Connect still has some funds left from the $5 million allocated from CAMPO’s SMP-MM grant and what the Council provided in 2013, and Prop. One passes, then rail planning for Highland/Riverside could go on while council thrashes about trying to deal with the $400 million in COs. Nonetheless, it would still be 2018 before any Project Connect plan would be ready for federal consideration and the ridership and the project won’t be any better. If Proposition One fails, then the new 10-1 council will be able to get organized and set its own priorities, one of which would be to disconnect Project Connect, along with its funding, and then assess where the community goes with Capital Metro, transit priorities, rail planning, and what role the city, itself, has in all this. Hopefully, any funding that is left from Project Connect could be held in abeyance until Council agrees to set up a new public study process that has real public input and gives public stakeholders ownership. Right now, Capital Metro has been so poorly used by politicians and the private political agendas the politicians represent, that we need to have a community discussion about what transit’s role is in the future and who does what. The city and the transit authority, after all, have to agree upon how to use the limited assets we call the public streets. We have to decide whether streets are for people (pedestrians, bikes, and transit) or sewers for cars. 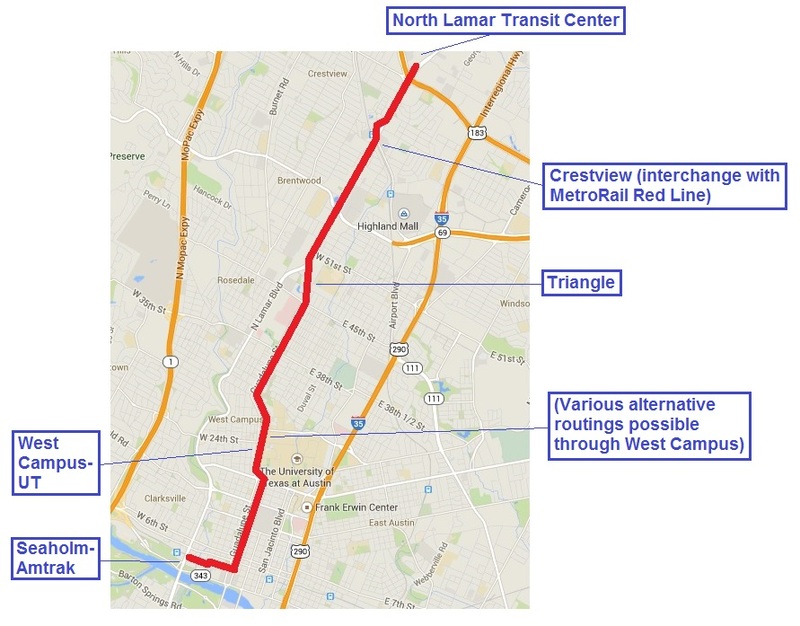 While some of our elected officials piously claim we can’t give up automobile travel lanes for rail on Guadalupe and Lamar, the CAMPO plan (its Capital Metro elements) projects dedicated bidirectional busways for MetroRapid on all of the best potential rail routes in the city by 2025. 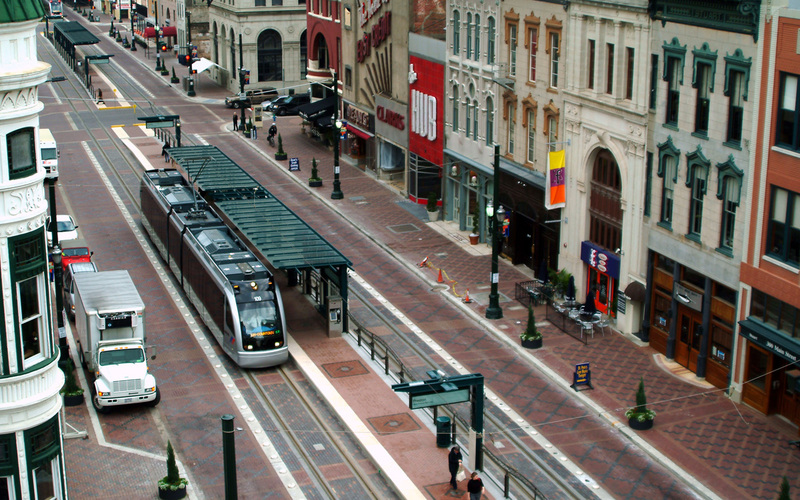 Houston’s MetroRail light rail transit system runs on dedicated tracks on Main St., re-allocated from traffic lanes. Photo: Houston Metro. 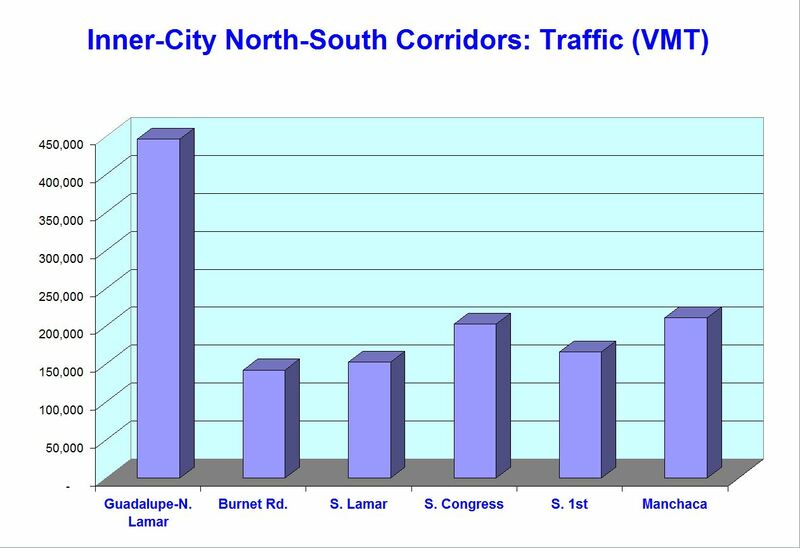 Given the undeniable need, now becoming patently obvious to most of the attentive public, that something must be done in the core along the Guadalupe/North Lamar corridor, the new Council will be under enormous pressure from most of the Project Connect supporters and the loyal opposition pro-rail supporters to begin anew looking at a rail proposal that has the right combination of route, ridership, capital cost, and O&M numbers that gets the most bang for the buck. Again, we’re looking at 2018 before any plan could be completed and eligible for Federal Transit Administration funding. Supporters of the Proposition 1 urban rail proposal have been issuing dire warnings that “there’s no Plan B” if Prop. 1 — with its Highland-Riverside rail line — is rejected by voters on Nov. 4th. 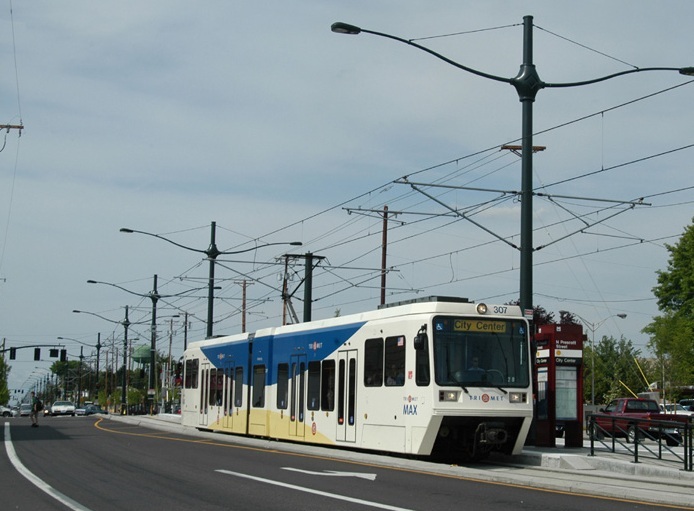 Light rail transit (LRT, a.k.a. 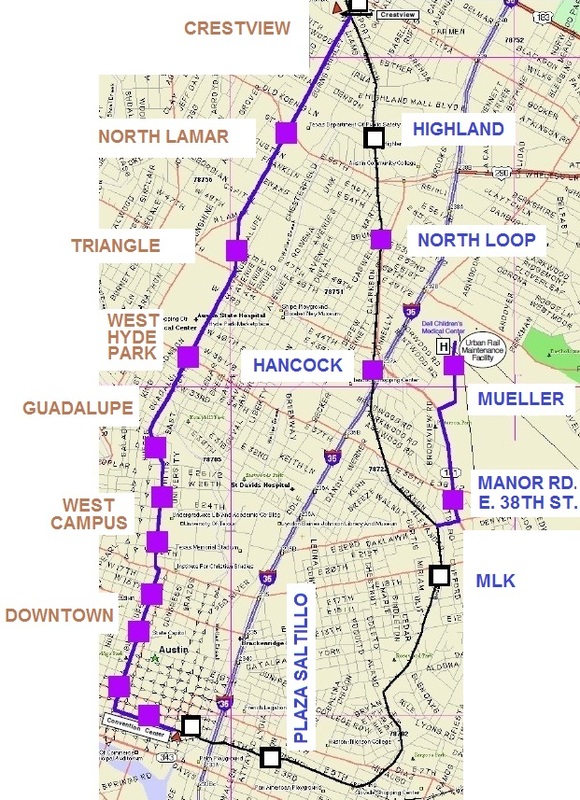 urban rail) for the Guadalupe-Lamar (G-L) corridor has been in various stages of planning since the late 1980s. 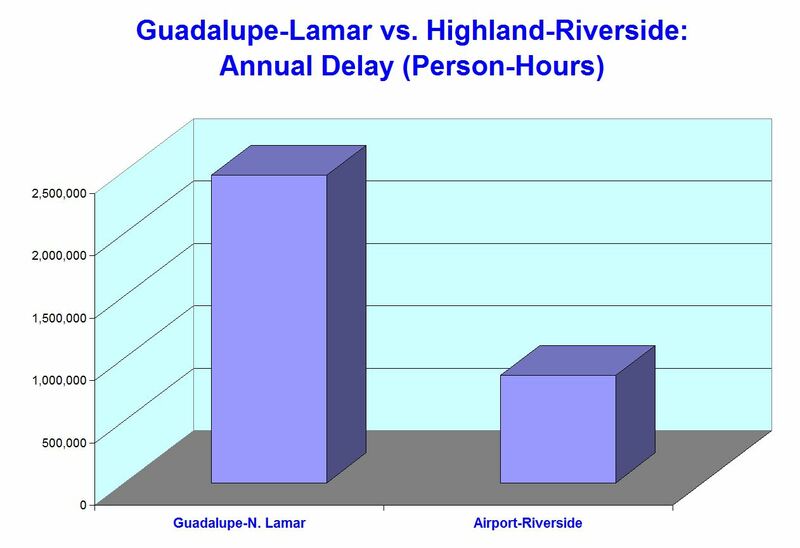 The ridership potential has been assessed in the range of 30,000-40,000 a day (see Austin’s 2000 light rail plan — Key documents detail costs, ridership of Lamar-Guadalupe-SoCo route). In this particular proposal, including elements in both alternative G-L plans listed above, we present a plausible and fairly simple option for an LRT starter line aimed at minimizing design and cost while providing an attractive service with adequate capacity. Like the Prop. 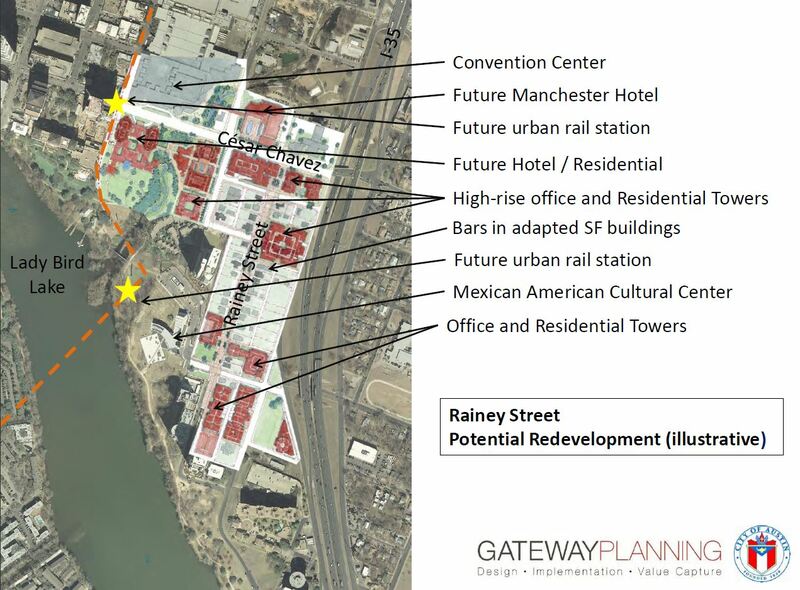 1 plan, this would require re-allocation of some traffic lanes to dedicated rail transit use, some intermittent property acquisition, and streetscape amenities including pedestrian and bicycle provisions. Our plan would route LRT entirely on the surface; thus there are no major civil works (although there is a bridge included over Shoal Creek and rebuilding of the pedestrian interface). We assume a 6.8-mile line starting at the North Lamar Transit Center (NLTC, Lamar and U.S. 183) on the north, running south down North Lamar and Guadalupe, then Guadalupe and Lavaca to the CBD, then west on 4th and 3rd Streets to a terminus to serve the Seaholm development and Amtrak station at Lamar. (See map at top of post.) 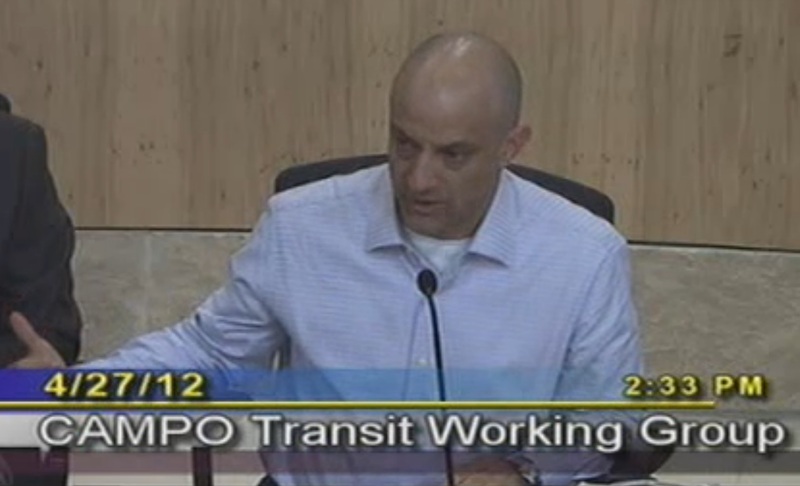 We’ve assumed 17 stations, but have not proposed specific locations except for the termini at NLTC and Seaholm-Amtrak. 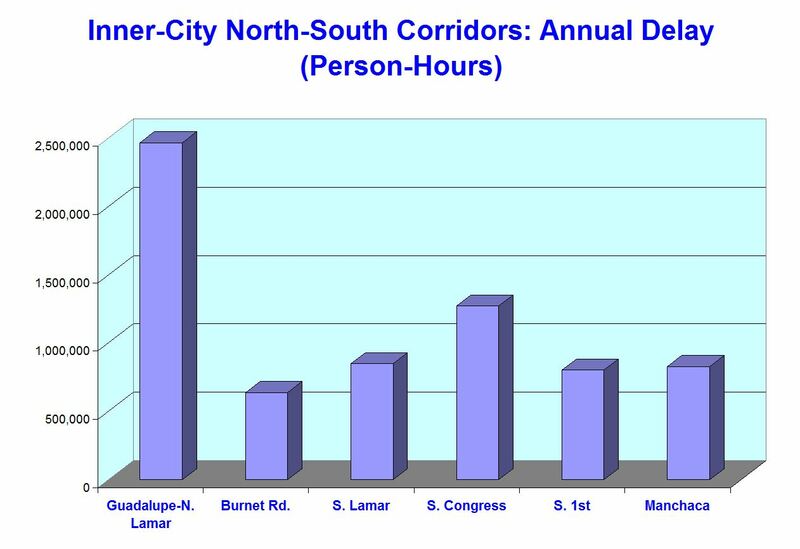 As a starter line for urban rail, this plan would serve Austin’s most heavily traveled inner-city corridor (North Lamar Blvd. and Guadalupe St.) plus the West Campus, Texas’s third-densest residential neighborhood — both totally ignored by the seriously flawed Prop. 1 plan. Our plan would also serve the Seaholm-Amtrak area. All these crucial residential and activity areas are missed by Prop. 1’s proposed line. At Crestview, we’ve assumed a track diversion into and through the mixed-use development to facilitate interchange with the MetroRail Red Line; the tracks would return into N. Lamar at each end of the development. 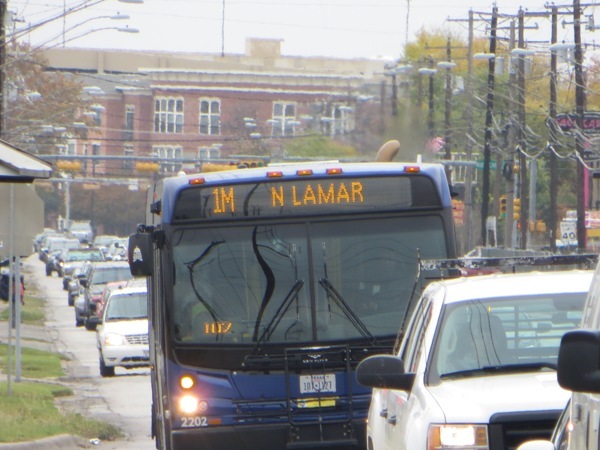 There are other options for achieving this transit interface, including a major overhaul of the entire intersection of N. Lamar, Airport Blvd, and the Red Line. Through the West Campus area, to serve this dense neighborhood and the University of Texas campus, we’ve assumed a simple route on Guadalupe. However, several other options are possible, such as a split-directional alignment with one track on Guadalupe and another on Nueces. We assume 30,000 to 40,000 as a plausible potential ridership range for this proposal, based on previous forecasts for this corridor plus factors such as the interconnection with MetroRail service at Crestview, and extensions both to U.S. 183 and to the Seaholm-Amtrak site. Our “horseback” design and cost assessment (generally similar to a typical “systems-level” engineering estimate) envisions sufficient rolling stock to accommodate this volume of daily passenger-trips in 3-car trains at 10-minute headways. We’ve estimated average schedule speed at 16 mph and a round trip of roughly an hour. On this basis, we’ve assumed a fleet of 30 LRT railcars, including spares. Storage, maintenance, and operations facilities would be located at the NLTC, which would also provide expanded park & ride facilities. 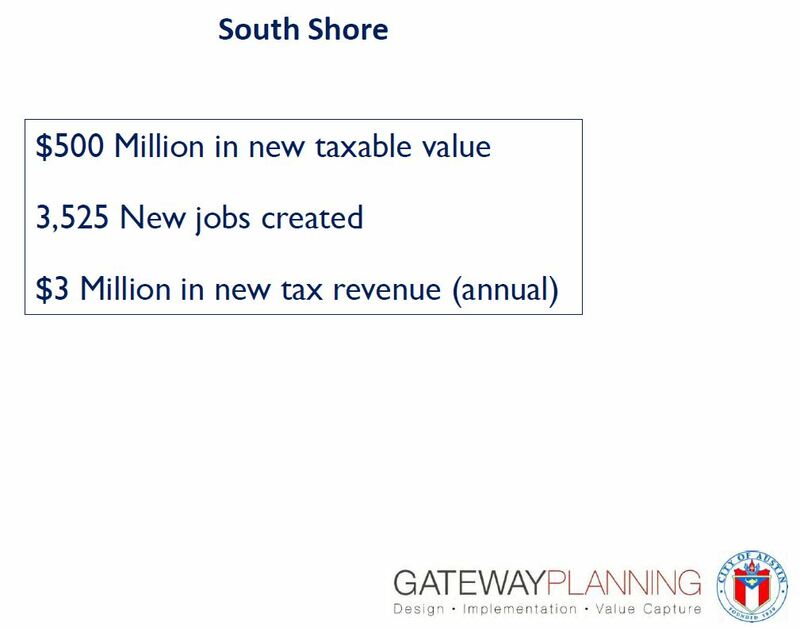 As presented in the table below, we’ve estimated the capital investment cost of this project at $586 million. We believe this is a far more affordable investment for an initial LRT starter line than the daunting $1.1 billion ($1.4 billion in year of completion) estimated for the Highland-Riverside proposal in Prop. 1. With 50% Federal Transit Administration funding assumed, this would mean a local share of $293 million, most likely financed from local City of Austin bonds and possibly other sources. Line installation includes right-of-way acquisition, trackwork and running way construction, minor civil works, electric power supply and distribution, signal and communications system, stations and facilities, and streetscape amenities, including sidewalks and bicycle lanes. Rolling stock is assumed as “short” low-floor LRT cars similar to those recently procured in Salt Lake City and Atlanta; a storage, maintenance, and operations facility is included. Total cost includes a 25% contingency and a 15% administrative/engineering allowance. Unit capital cost of this “Plan B” project calculates to about $87 million per mile — roughly 73% of the cost per mile of the Prop. 1 proposal. Total cost is 52% of the Prop. 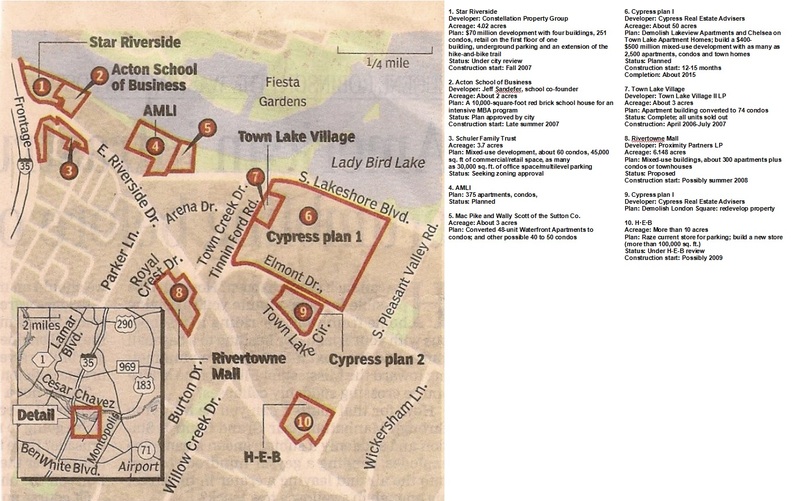 1 Highland-Riverside plan. Thus, for just over half the cost of the Prop. 1 plan, this proposal would render about three times the ridership. We’d expect this high ridership (as well as high passenger-mileage) to translate to signficantly lower operating & maintenance (O&M) unit costs compared with the Prop. 1 rail proposal, as well as lower unit subsidies. 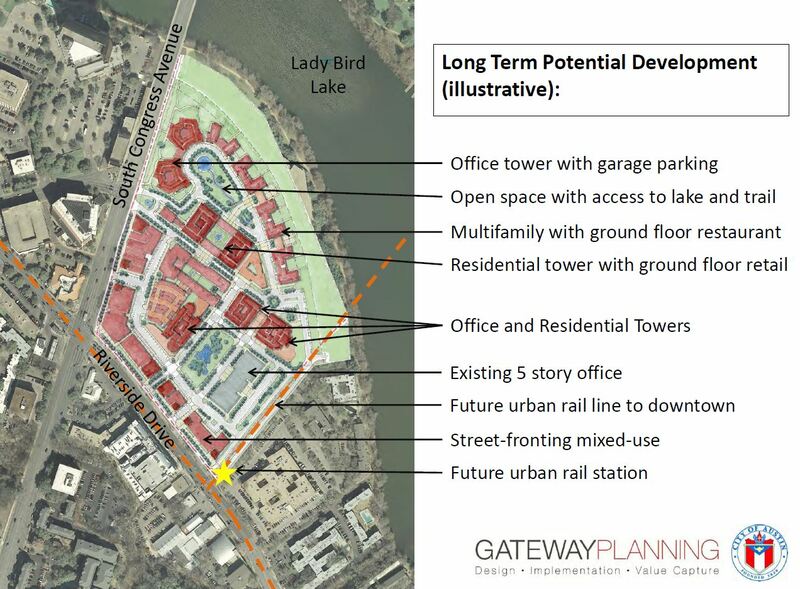 In addition, it would serve Austin’s most heavily travelled inner-city arterial corridor, one of the state’s densest neighborhoods, the city’s highest-density corridor, and a number of Austin’s most established center-city neighborhoods — neighborhoods that have anticipated and planned for light rail for well over a decade. It would also serve centers of development such as the Triangle area, clusters of major new development emerging in various segments along the corridor, and much of the very high-density residential and commercial development booming in the western section of the CBD. 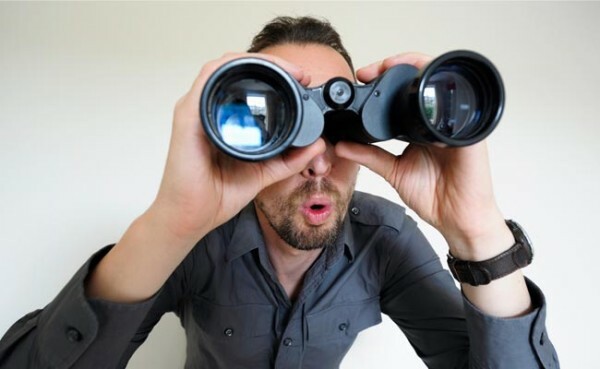 You are currently browsing the _______________Austin Rail Now blog archives for October, 2014.